Hotels: Pre and post tour accommodations are available at $80 per person per night base on double sharing. Single traveler at $160/per night. All hotels are well-selected three-star, with continental breakfast included. Hotel details are provided 24 hours before check-in date (including pre/post and tour hotels). Single Supplement: CAD80/per night. Payable once clients request for single rooms at the time of Booking. No single supplement will be charged if clients are willing to share room with other tour member of the same gender. Once the final decision has been make, it will not be possible to amend the choice later. No complaints could be accepted regarding this issue. Paris is your oyster over the next two days as you enjoy guided tours around one of the world’s most celebrated cities. Your Parisian adventures get off to a spectacular start with a drive along the famous Champs Élysées to the Place de la Concorde, which played such a key part in the French Revolution. 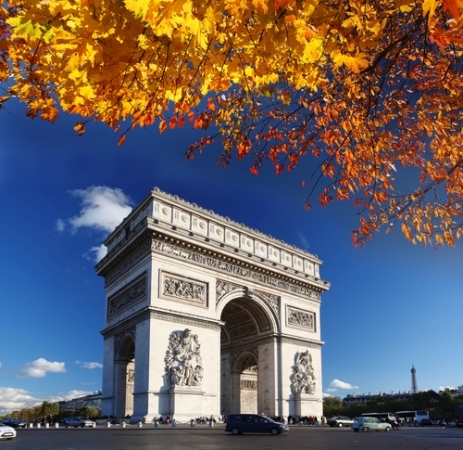 You’ll also get to see the iconic Arc de Triomphe here too, the imposing monument that sits near the western end of the avenue and commemorates the fallen of the revolution and Napoleonic wars. You’ll take in another significant historical building next as you head to L’Hôtel National des Invalides, where Napoleon’s tomb is located. Then it’s on to the most legendary of all Paris’s icons: the Eiffel Tower. Choose to make the optional ascent of the tower for unbeatable views over the city, and a truly memorable experience. Back on ground level you can take a more leisurely cruise along the river Seine, a great sightseeing option that offers views including Notre-Dame Cathedral and Pont Alexandre III. Finally, you’ll travel on the coach out through the Parisian suburbs to the splendid Palace of Versailles, the vast regal château that was the residence of the royal family until the start of the revolution in 1789. Today the palace is another popular Parisian attraction. In the evening, you can enjoy one of our optional Paris evening shows. The second day of your Parisian experience begins with a visit to the Louvre, one of the world’s greatest art museums. Here you’ll set your eyes upon some of history’s most famous masterpieces, including the Venus de Milo, Winged Victory of Samothrace (also called Nike of Samothrace), and Leonardo da Vinci’s Mona Lisa. Opt for a guided gallery tour, which will enhance your experience and allow you to browse through hundreds of works in just a few hours. After an exhilarating morning of walking the gallery corridors, replenish your energy levels with lunch in the museum before heading to the area surrounding the Palais Garnier, Paris’s opera house. Here the rest of the afternoon is yours to shop at legendary department stores Galeries Lafayette and Printemps, sightsee or simply sit and sip. After boarding the luxury coach in Paris, sit back and enjoy a scenic journey across classic French countryside en route to mountainous Switzerland. 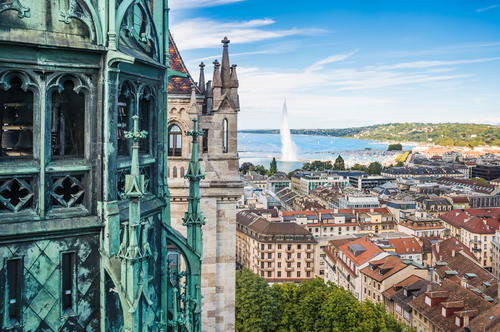 You’ll pass through Basel, which is located at the point where the Swiss, French and German borders meet, before arriving at the picturesque lakeside city of Lucerne, nestled at the foot of the snowcapped Swiss Alps. 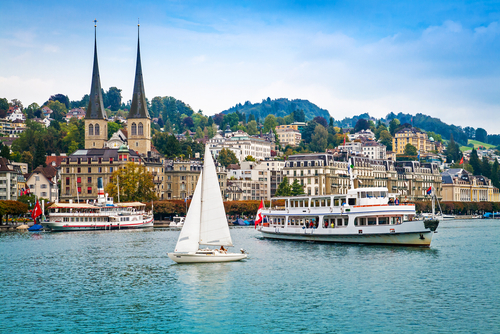 Here you’ll get to see Lucerne’s famous landmarks, including Chapel Bridge, the Water Tower, and some wonderfully preserved Baroque and Gothic architecture, followed by some free time to shop or take pictures. Spend the morning in the company of a knowledgeable local guide as you explore Venice, the most magical of cities. Begin with a waterbus ride to San Marco Island, a memorable crossing of the lagoon that gives you a real taste of the city’s charm as you approach the dreamy spires and distinctive waterside buildings. Once on the island you’ll be led around some of Venice’s best-known locations, beginning in the Piazzo with the Basilica di San Marco, a stunning piece of Byzantine architecture. You’ll also see the legendary Bridge of Sighs, which appears on many a postcard or picture of Venice and connects the old prison to the interrogation rooms in the Doge’s Palace. Afterwards you’ll have a chance to see some traditional Venetian craftwork at close quarters with a demonstration by Murano glassblowers; their exquisite creations make excellent souvenirs. Of course, the ultimate Venice activity is to ride through the warren of waterways on a gondola, and for most people this optional excursion is a must. Step aboard, relax and enjoy this once-in-a-lifetime experience. If you’re hungry after an action-packed morning you can choose to fill up with an optional delicious homemade Italian spaghetti meal, before enjoying more free time in this sublime city. Transfer to Rome in the afternoon. Your day in Rome starts with a visit to the smallest country in the world, The Vatican City, which lies at the heart of the Italian capital. Here you’ll marvel at St Peter’s Basilica, home to Pope Francis and arguably the most significant site in Christianity. The exquisitely beautiful Basilica has been present here for almost 1,700 years and contains a bewildering collection of paintings, frescoes and design crafted by some of humanity’s most famous artists, which you can explore. Alternatively you can choose to add on the optional Sistine Chapel tour to view Michelangelo’s famous painted ceiling. Next you’ll see the famous Trevi Fountain, the lavish Baroque showpiece where people flock to throw coins into the water – an action which is said to ensure that you’ll return to the city again one day. After lunch, take a step even further back in time as you visit Italy’s unrivalled Roman relics. An optional guided tour of the Coliseum, built in AD 72, is highly recommended. History comes to life as you imagine yourself witnessing gladiatorial combat inside the spectacular amphitheatre, or alternatively you can walk at your leisure around the outside to admire the facade of this ancient wonder. After the Coliseum, get up close to the nearby Arch of Constantine, which dates back to the fourth century AD, then spend some further free time enjoying Rome, sampling the rich and creamy delights of “gelato” Italian ice cream. Next, you can choose to visit the magnificent Basilique Santa Maria degli Angeli e dei Martiri near Piazza della Repubblica or do a bit of shopping at the Mitsukoshi Department store before transferring to Arrezzo in the late evening. Your voyage of cultural discovery continues as you get to know Florence, the birthplace of the Italian Renaissance and home to some fabulous architecture and fine art. Begin the day by taking in a wonderful panoramic overview of the city from Piazzale Michelangelo, which boasts glorious vistas over the red roofs, Arno river and ancient city walls out towards the surrounding countryside. Next you can see a demonstration of the traditional craft of leather working at close quarters in a local workshop, and you’ll also have the opportunity to purchase some of the high-quality leather items for which the city is famous. From here you’ll enjoy a guided walk around Florence’s many highlights, including the Ponte Vecchio over the Arno, the Piazza del Duomo and Campanile Tower. You’ll pass the Uffizi Gallery, which contains one of the most notable art collections in Florence. You’ll have free time to see the city further, to shop or to watch the world go by from a streetside cafe, before travelling on to your next destination, Pisa. Here you are free to wander, but be sure to have your camera ready to get a shot of the iconic Leaning Tower, the famous bell tower in the ‘Square of Miracles’, which also contains the centuries-old Cathedral and Baptistry. 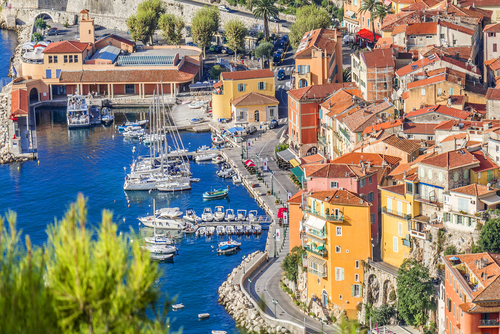 A breathtaking drive along one of Europe’s most famous stretches of Mediterranean coastline awaits as you say arrivederci to Italy and head for Monaco. This small principality, enclaved in France, contains some big attractions and high rollers: look out for the famous Monte-Carlo casino as you cruise into town. A walking sightseeing tour here takes you to the grand Prince’s Palace, where you’ll have some free time to soak up the refined atmosphere, before continuing on to view the 1920s Courthouse, the cliffside Oceanographic Museum, and the cathedral, where Grace Kelly is buried. We then travel a little further to visit the famous Fragonard Perfume Factory. Here you’ll be taken on a fascinating guided tour around this working factory. Next it’s Nice, where you’ll stop for lunch to sample some excellent local cuisine and warm-hearted hospitality. 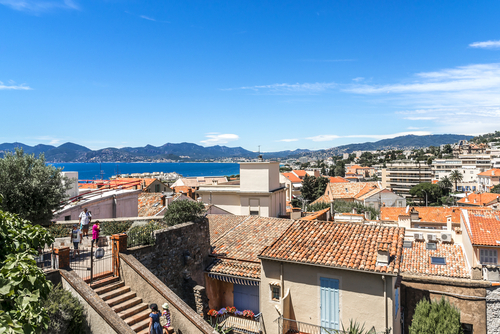 Your journey continues to Cannes, where many a movie star has enjoyed the sweet smell of success. Be sure to take the opportunity to snap some photos of the Palais des Festival, home to the city’s annual international film festival, before transferring to Avignon Nord. For some guests it will be time to say a fond farewell to new friends upon arrival back in the capital, while others may choose to extend their European adventure with another night in the capital and then continue on with the Red Line tour the following day. (2) 120-90 days before departure- 75% of tour price. (3) 90-45 days before departure- 50% of tour price. (4) 45 days before departure – No refund. Compass Holidays is not liable for any delay or expense of any kind. Compass Holidays will accept no responsibilities for losses or additional expense due to accident, delay, weather, strike or cause beyond its control. Passengers must have a valid passport. Your passport must remain valid for at least 6 months from the arrival date. Compass Holidays will not be held responsible for any expenses if passenger is refused entry by any country.Compass Holidays is not liable if passenger decide to withdraw during the tour. Compass Holidays reserves the right to alter or curtail the itinerary substitute hotels and/or conveyances as it is deemed necessary. Compass Holidays will not accept liability for acts of violence for any single sharing a room with others. Any unused portion of the tour is non-refundable, including meals listed in the itinerary if for any reason you cannot continue with the tour after departure. Compass Holidays also reserves the right to request any individual to withdraw from the tour if deemed his/her act of conduct is detrimental to or incompatible with the interest, harmony and welfare of other passengers and the tour as a whole. Compass Holidays shall be under no further liability thereafter to any such person. Purchase of European travel insurance is strongly recommended. We will be pleased to assist in enquiries of any travel insurance. Paris City Entrance Tax ＋ Overnight City Tax (Per Person Per Day) €15（client pay on spot）Must be paid prior to entering the cities – no concessions available. (R) Paris City Entrance Tax ＋ Overnight City Tax (Per Person Per Day) €15（client pay on spot）Must be paid prior to entering the cities – no concessions available.